will keep tweaking this recipe till its perfect, but I wanted to share "as is"
This recipe is the property of Mathematical and released under the CC Attribution-NonCommercial-NoDerivatives 4.0 license. You may not copy, derive or commercialize this recipe without following the terms of this license or the explicit permission of the creator. This is a damn fine start to a great banana puddin. 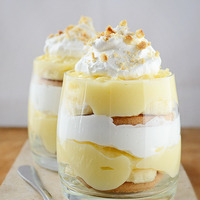 For my own tastes, I might flip-flop the LA and TFA banana, or even look at simply using VT banana custard.